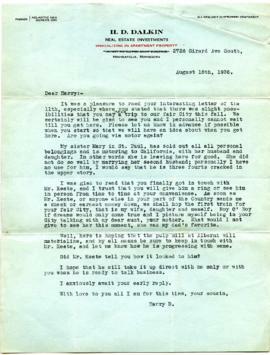 Letter sent to Harry Seidelman from Harry Dalkin in Minneapolis, Minnesota, U.S.A., dated August 18, 1936. 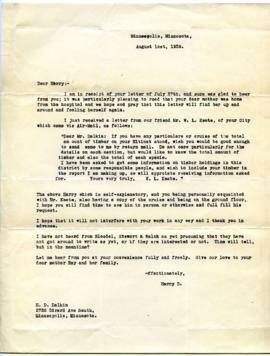 Letter sent to Harry Seidelman from Harry Dalkin in Minneapolis, Minnesota, U.S.A., dated August 1936. Letter sent to Harry Seidelman from Harry Dalkin in Minneapolis, Minnesota, U.S.A., dated February 18, 1937. Letter sent to Harry Seidelman from Harry Dalkin in Minneapolis, Minnesota, U.S.A., dated January 28, 1936. Letter sent to Harry Seidelman from Harry Dalkin in Minneapolis, Minnesota, U.S.A., dated June 20, 1937. Letter sent to Harry Seidelman from Harry Dalkin in Minneapolis, Minnesota, U.S.A., dated March 16, 1937. Letter sent to Harry Seidelman from Harry Dalkin in Minneapolis, Minnesota, U.S.A., dated March 9, 1936. Letter sent to Harry Seidelman from Harry Dalkin in Minneapolis, Minnesota, U.S.A., dated October 29, 1936.A new address of "3227 Garfield Ave So." replaces the previous one in the letterhead.